One of the most popular ways publicists and brands seek to connect with members of the press, bloggers and other influencers is through hosting seasonal, industry-only press previews. Essentially a mix of browsing new collections, meeting the designers and getting the low-down on each brand's seasonal flavor (plus an often-hefty dose of wine), attending a press preview can be a great way to build relationships with brands for future stories, styling pulls or events. If you've never been to one or have been invited and aren't sure what to expect, heed the advice of Kelly Fletcher, CEO of Fletcher PR. a national communications firm that specializes in marketing to women. And, if you are lucky enough to be in New York on Thursday, Kelly has extended an invite to IFB bloggers to attend the JVT Spring Jewelry Preview (see details at the end of the post!). What exactly is a press or media preview? What are the goals of such an event? A press or media preview is an event staged by a brand or group of brands to showcase their products to the media. Our goal is to reach as many key influencers as possible which includes the media, bloggers, and stylists. We highlight our products in hopes of media coverage, product placements, and general exposure to consumers who may be influenced to purchase based on media recommendations. What types of opportunities are available to blogger who attend media previews? Bloggers who attend media previews can expect exposure to brand representatives, photo opps, interviews opps, and usually some great beverages and swag. Are there any expectations about blog coverage if a blogger attends? Not really. Obviously, our hope is that the blogger will fall in love with our brand/product and do a feature story on their blog pointing consumers to the web site, but it’s not a requirement. We want the recommendation/review to be authentic and if it’s not a good fit for your blog, we get that. What are 3 ways a blogger can make the most of a press preview? 1. Turn the press preview into an opportunity to build your credibility. Hey, if the fashion blog I follow is out and about at events in NYC then he/she must know what’s going on. 2. Educate yourself. Turn press previews into an opportunity to discover the latest trends and designers who created them. 3. Network, network, network. Press events a plethora of contacts for bloggers—and despite the fact that we all communicate electronically these days, there is literally no substitute for personal communication. If a blogger wants to be on the invite list for media previews, how should they get in touch and what should they say? Email PR firms that specialize in your field of interest. Search the O’Dwyer’s database, PRSA, and even Google to identify firms in your area that may host events or be seeking coverage from bloggers. Companies are increasingly aware of the influence of the blogosphere and expect their PR firms to engage relevant bloggers. What fun things can bloggers expect at your upcoming press preview? Umm, champagne and chocolate in a beautiful private loft overlooking Bryant Park for starters! 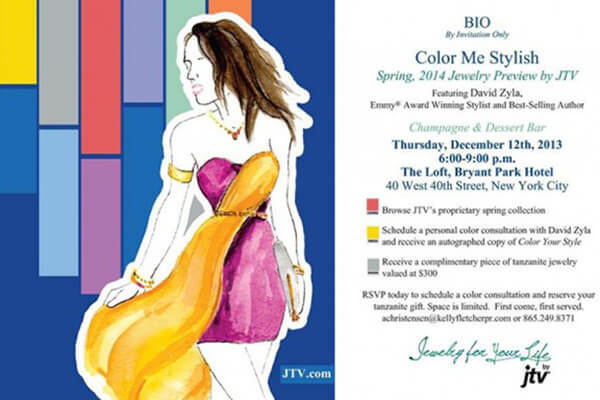 Our guests will preview Jewelry Television’s (JTV.com) glamorous array of trend-setting styles for 2014. They’ll also have an opportunity for a personal color analysis with Emmy Award-Winning Stylist and Best-Selling Author of The Color of Style, by David Zyla. Our lucky guests will take home an autographed copy of David’s book, along with a tanzanite tennis bracelet valued at $300 courtesy of JTV. Note: If you’re a qualified fashion blogger with a substantial reach, please email Kelly Fletcher at kfletcher@kellyfletcherpr.com for a media pass to Thursday evening’s 2014 Jewelry Preview at Bryant Park Hotel in New York City. I’ve never been to such an event, but I would love to go. What is classed as ‘substantial reach’ though? The last few weeks have been a whirlwind of such events for me. They’re great. As the clothes aren’t going to hit stores for another few weeks (most won’t be available until at least January), I usually go to these events, take some pics with my phone and then add them to Instagram. Later on, I may curate some of my favourites to add to a post (closer to when the collections hit stores).